Made of high quality waterproof material, durable and can provide long term using. Small and lightweight.With 6″ x 4.5″ Folded Size,You can just throw it in your bag, pocket, or car when no using. And if there is sudden rain, it can be used as raincoat. The compact pocket blanket is waterproof and puncture resistant. Sand won’t stick to the blanket, it is very good for enjoying sun bath on the beach. 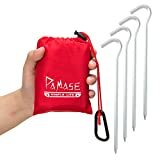 There are four corner loops, four tent nails and a carabiner in the package. It is very useful to have these little loops to pin the blanket down when it’s windy and the pockets work well to slip a rock in to also hold it down. Multi-porpose of this blanket. Can be used as raincoat, picnic blanket, camping blanket, hiking blanked, beach blanked, yoga mat, pet blanked, ground cover and many other outdoor sports.